The wireless switch modules provides the convenience of a standard wall switch without the mess of installation. 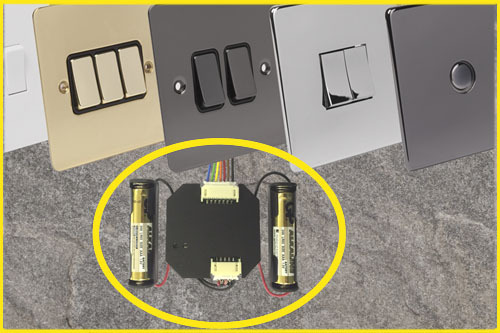 Space permitting, the module can be fitted directly behind any wall or flush mounted switch with a regular 25mm back-box. The module provides 1000 meter line-of-site range. Each switch can be programmed to control the whole garden or a selected area. Multiple switches may be installed to operate as 2-way switches. Can be used in conjunction with Key Fobs, Remote Controls, Wall Switch Modules, I-Port Phone Interface so that if you choose, you have multiple ways of controlling the same system.